To improve the out-of-box experience, first-time user experience and user onboarding of Osmo and to craft proprietary experiences for next-generation hardware. 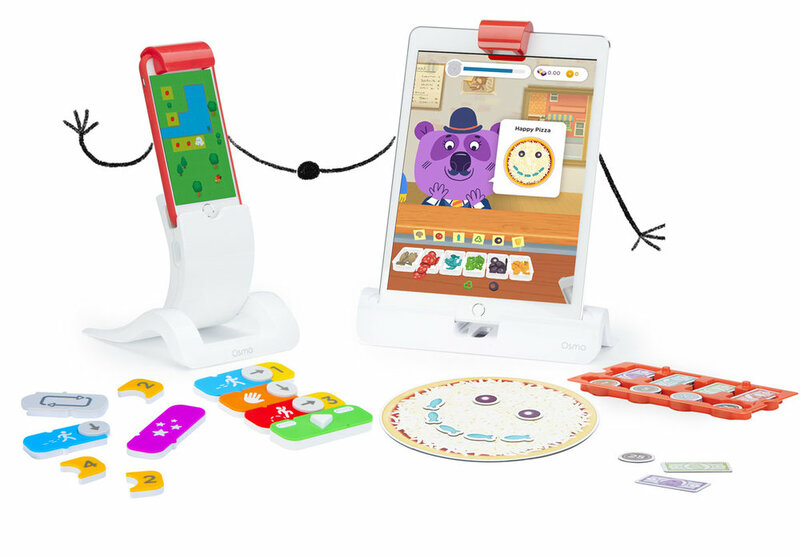 Osmo is an award-winning educational mixed-reality game system for kids ages 5 to 12. Osmo is on over one million iPads around the globe and has been chosen as TIME's best inventions of 2014. Process · Analysed existing onboarding experience from unboxing to in-game account management, determined pain points, met with stakeholders, designed and executed a research plan for validation, conducted multiple rounds of iterations with engineering team to improve onboarding. Worked closely with Marketing, Sales and EDU teams to bake in their business goals. Proposed new game system setup instructions using 3-D renders and videos for iPhone. Created a company-wide master checklist for any team to reference while launching a new game, helping teams determine exact Jira tickets to be entered. Helped with product-side email strategy. Designed onboarding emails and wrote creative copy for emails and all software-side onboarding. Results · Reached and exceeded KPI goal of 20% less customer tickets regarding onboarding during 2017 holiday season. My research also determined that the burden of re-accessing the Osmo ecosystem proved to be equally or at times even more important than onboarding. Communicated the importance of tackling this problem and encouraged our resources to be allocated to focus on re-engagement. Process · Met short timelines and came up with a strategy to migrate new and existing users to a new login system (per Apple's request) without the need to contact and update them on the changes. Co-created presentation to Apple to articulate process. Results · Almost no user complaints were received during this transition. Even though we introduced a new option to “skip” account creation, we saw an uptick in number of accounts created. Process · My qualitative research determined that the Osmo Creative Kit purchasers were missing an “a-ha” moment where they fully understood the items contained in the kit they had purchased. 2 games in particular were going unnoticed and setup instructions were unclear. I determined a need for a physical representation of our software to better communicate games that came with the kit. I proposed a set of printed collateral that warmly introduced our users to our game system and created a checklist for them to quickly setup and install their apps. Results · I helped our team design the Osmo "App Cards" and a variety of collateral to meet these needs. Designed low fidelity mockups and conducted in-person user testing, eventually passing them on to the branding and packaging teams. Replicated this process for our iPhone game system that had recently launched. ⌁ We diligently tested our hypotheses via Osmo's recorded "Appy" Hours, video/phone calls, in-school interviews, in-school shadowing and home interviews. I helped our Design Researcher create protocols for internal and external user testing sessions. ⌁ Worked closely with KidSAFE Seal Program to adhere to COPPA standards for all OOBX & FTUE. ⌁ Mapped out the user journey of an Osmo parent to determine opportunities for our next generation hardware. The form factor and technical specks were determined by the co-founders, computer-vision and industrial design teams. I lead the research and proposals for its main value proposition, concluding that a . . . [ In Stealth Mode ] . . .
⌁ Crafted survey questions for beta testers and hardware team as part of an in-depth effort to create user personas for R&D hardware. Coded the qualitative results and mapped out feedback and insights from Osmo kids and parents. Conducted home visits to test our prototypes and theories for R&D hardware. Provided research and guidance for our design vendor. Designed wireframes, created interactive prototypes and tested with parents, teachers and kids. Process · Introduced the idea of a Conversational User Interface to onboard our users. Conducted research, designed wireframes and mockups. Determined KPIs and businesses goal to be met by adopting a CUI design. Created a report and conducted Osmo’s first company “pre-mortem” to evaluate risk. Results · The prototype and pre-mortem exercise accomplished its purpose and we decided that the cost/value trade-off wasn't strong enough. ⌁ Worked on the strategy and design of announcing and showcasing new hardware game system (iPhone) across all of playosmo.com. Designed its landing page for soft launch. ⌁ Wireframed, prototyped and polished UI for educator power tools. ⌁ Designed concept for the 2.0 of Osmo's parent and teacher portal. ⌁ Designed concepts and worked on strategy of companion app for parents. ⌁ Designed onboarding and game home for an add-on game. ⌁ Created and pitched low fidelity prototype to teach kids how to tell time as part of Osmo's internal accelerator called 'Dreamweek'. ⌁ Worked to unify UI across all non-game environments, including parent/teacher portal and the shared menu within game apps. Unified colors and fonts, updated menus, settings, the login experience, copy etc. ⌁ Worked on the storyboard and character dialogues of a game launch video and assisted video producer during filming. ⌁ Sourced and interviewed contractors for UX research position. ⌁ Created feedback trackers for all Osmo projects. Drew conclusions from these trackers to help team determine new opportunities. ⌁ Helped determine milestones and sprints for project. ⌁ Documented research spending for accounting department. ⌁ Conducted vision/mission/goals exercises with project managers to help determine needs and 'big audacious goals'. ⌁ Researched, planned, branded & pitched the concept of "Tender Care". Paying extra attention to neglected parts of the product, office, our team-mates, every first Friday of the month. As a result: “Tenderly caring” became a part of company lexicon, multiple employees periodically reported its benefits. Tender Care’s monthly communal lunches (to increase dialogue and mingling among employees) were adapted by the company and became weekly communal lunches. ⌁ Participated in mentoring program to mentor a colleague. ⌁ Started bi-weekly classes among the hardware team to knowledge-share and idea-exchange.